Who is Instructor Daryl Brigman a.k.a Onca? Instructor Onca (own-sah) was born in Dillon, South Carolina. At a young age, he has always wanted to do Capoeira. Unfortunately, there were no schools in South Carolina at that time. While attending school at the College of Charleston in Charleston, SC, capoeira came. He began training capoeira in 2005 under Professor Queixo, a student of Mestre Carioca and Mestre Bom Jesus.Ã‚Â He graduated with his Instructor (instructor) cord in 2012.Ã‚Â He has several years teaching kids and adults.Ã‚Â At 10 years of continuous training, he gained valuable knowledge about the art Capoeira, and its disciplines, from traveling and training with Mestre Carioca and Mestre Bom Jesus inÃ‚Â Vila Velha, Brazil and throughout the United States. Ã‚Â He also participated in his first Capoeira Games competition in New Jersey at Boca Capoeira where he won 1st place in Advance Division, and Best Benguela, Angola and Iuna games. 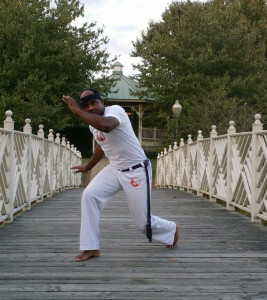 In September 2015, he moved to Baltimore, Maryland to be with his wife, Marinheira, who also trains Capoeira. They have one son, Oncinha, who is a future capoeirista. Carioca schools are in NYC, Charleston, SC; Miami, FL; Baltimore, MD; and Columbus, OH.